Opposite side one-hand hold wrist grabs are typically one of the first basic attacks that a new student to Aikido is trained to address. Although arguably not a particularly martial or common contemporary attack form, learning to neutralise and redirect an attack of this kind can nonetheless be surprisingly challenging both at static and free-flowing level. Training to deal with wrist grabs is particularly useful for learning and reinforcing many of the basic principles that underpin our Art. The less aggressive nature of the attack (compared to say a strike) allows the nage (i.e. the receiver of the attack) to more readily focus on such things as correct footwork, moving around the point of contact, basic balance breaking principles, correct posture and movement, maintaining centre and getting off-line. Cross hand wrist grabs in Aikido practice are referred to as Ai hanmi katate dori, Kosadori or Katate kosa dori. The name used depends on the school and some use the terms interchangeably. 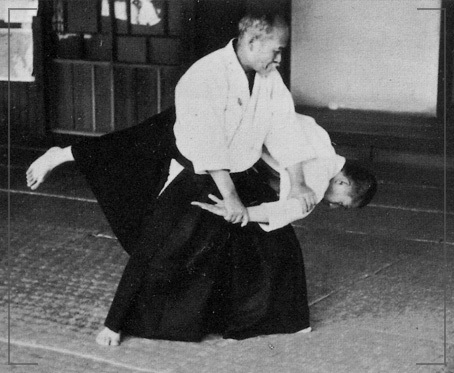 Generally speaking, ki aikido schools tend to use the term Katate kosa dori. In the below video, Mike Jones Sensei (New York Aikikai) demonstrates and provides instruction on the 2 basic forms (omote and ura) of the Aikido technique ikkyo when applied in response to a static cross hand grab. Further detail on how to apply the technique is provided in the Additional Notes section below. 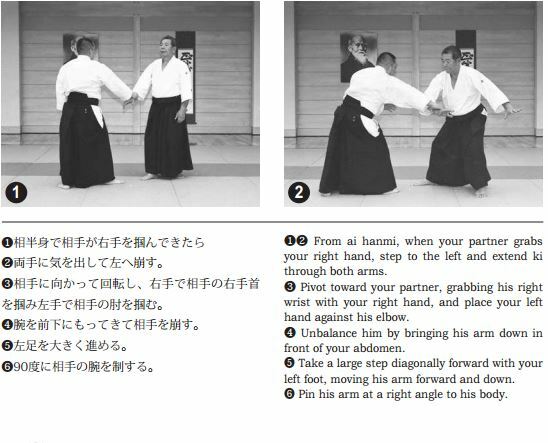 See below a photo demonstration (including description) and accompanying video by Morihiro Saito Sensei (9th Dan) of the key elements that make up the basic form of Kosadori ikkyo omote. The below video provides important training tips by Sensei Andy Hathaway (London Aikido Club) for performing Ai hanmi katate dori/ kosadori ikkyo (omote). In the below video seniors from our dojo demonstrate the way we typically practise kosadori ikkyo at ki no nagare (free flowing) level. Notably, the application incorporates a direct entry movement combined with an atemi intent (i.e. an elbow strike) to break the balance of the uke. As demonstrated in the video, this method of application is more easily learnt by first practising it from shomenuchi ikkyo. The below videos provides important training tips by Sensei Andy Hathaway (London Aikido Club) for performing the traditional version ura version of Ai hamni katate dori/kosadori ikkyo.